I have spoken about this at length before. Meaning how clients define their target audience in Lebanon, and how confusing it is. Which brings us to Rolls-Royce Lebanon doing a Facebook ad for their Ghost model. Apparently, the Ghost is the "entry model" from the upscale car brand and retails at around 250,000 USD. To quote Julia Roberts in Pretty Woman "[Nervous Laugh] A quarter of a million dollars?" 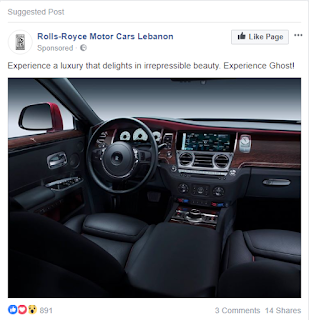 - but hey it seems Rolls-Royce thinks the average Lebanese Facebook user has this much money to spare. In other news - H&M is on sale!